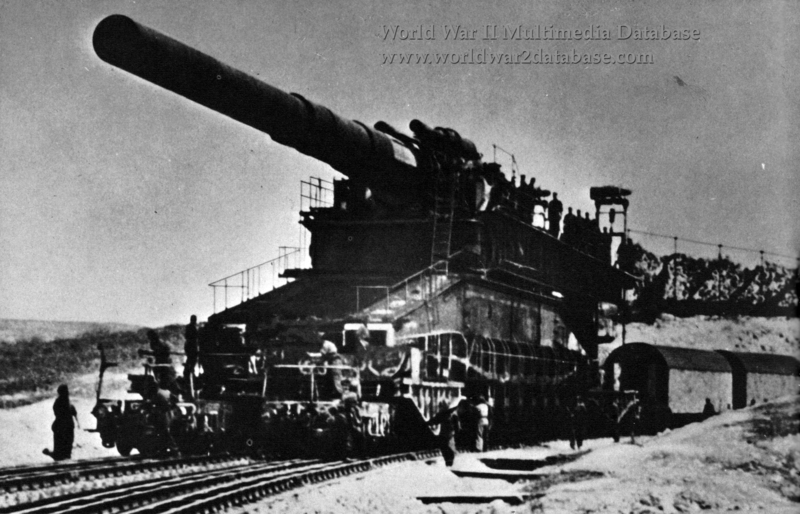 The 800mm (31.5 inch) Schwere Gustav Kanone Eisenbahgeschutz (Heavy Gustav Cannon Railway Gun) nicknamed "Dora" prepares to fire on Soviet positions at Sevastopol. Designed by Dr. Erich Mueller at Friedrich Krupp Aktiengesellschaft Gun Works in Essen. The need for an 800mm artillery piece was questioned by some German officers, who were silenced when Reichsklanzler (Reichchancellor) Adolf Hitler personally ordered it into production in 1939. The Schwere Gustav was part of a rearmament program that included the 600mm (23.6 inch) "Karl" Morsers (Mortars) and the Krupp K5 280mm (11 inch) railway guns for use against the Maginot Line. None of the German heavy guns were ready by the time of the Battle of France. Krupp built two of the 800mm guns; they were named after Krupp's director, Gustav Krupp von Bohlen und Halbach (August 7, 1870 - January 16, 1950). "Dora" was the gun's security code name. The gun had two types of shells. The armor/concrete-piercing shell weighed 7.1 tons (7,100 kilograms) and could pierce 22.9 feet (7 meters) of reinforced concrete or 3.3 feet (1 meter) of rolled steel armor. The high-explosive shell weighed 4.8 tons (4,800 kilograms) and left a 30 foot (10 meter) wide crater. Dora was test-fired on November 25, 1941, and Schwere Artillerie Abteilung (E) 672 was formed under Diplom-Ingenieur Oberst-Leutnant (Certified Engineer Lieutenant Colonel) Robert Bohm. Oberleutnant Geschutzfuhrer Knoll was the gun captain. (E) 672 rolled forward to the Crimea on four trains, complete with anti-aircraft gun cars. Some 450 men crewed the gun, and on site in Bachtschissarai, 2,500 laborers cut through a mountain and laid the four parallel rail tracks that Dora needed to be mobile. With anti-aircraft crews and guards, 5,000 men were attached to the gun. Two giant cranes, shipped by Krupp from Essen, helped assemble the gun and then served her with ammunition. The curve of the tracks seen here would allow the gun to be placed by three diesel-electric locomotives precisely to fire on Sevastopol. The first firing took place on June 5, 1942, some two months after Dora was ordered to Sevastopol. Dora fired eight shells at coastal guns emplaced in Fort Maxim Gorki I and six shells at Fort Stalin. Dora scored two direct hits and both targets were severely damaged. On June 6, Dora fired seven sells at Fort Molotov before targeting an underground ammunition bunker facing Severnaya Bay; nine shells were fired with six direct hits. On June 7, further shelling caused the ammunition bunker to explode, sending black smoke across the city. Fort Siberia was shelled on June 11 with five rounds scoring three direct hits. A week later on June 17, Dora fired five times on Fort Maxim Gorki II. On June 25, Dora's last combat engagement fired five high-explosive shells on the city of Sebastopol. The city surrendered on July 4, 1942. Dora was shipped to Leningrad to begin shelling that city, but as soon as she was emplaced, a Soviet counteroffensive caused Dora to return to Germany. She spent the rest of the war as a test gun, along with the second 800mm artillery piece. Sometime in April 1945, Dora was dismantled and destroyed. Her remnants were recovered by the Americans and melted down in 1950. Three of her shell cases are at the Imperial War Museum in London, the United States Army Ordinance Museum in Aberdeen, Maryland, and the Polish Army Museum in Warsaw.